Not all art is created equal. The logo you put together in the beginning, using low quality elements, may not be serving your purposes in today’s environment. We can re-create that logo in a format that will serve you well, with the flexibility of creating just about any file type necessary. Have an idea but need someone to help make your vision a reality? We will work with you to ensure what you have in mind is right on target. Armed with a smart logo, we can create any number of items to lend in marketing you business. 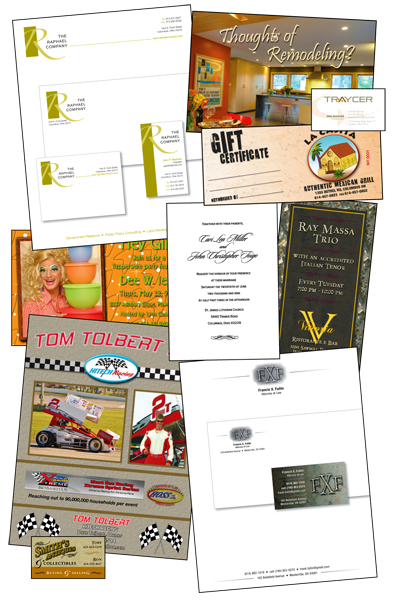 From business cards to brochures, post cards to posters and banners, we can help you look modern and sharp. Stop by or call Tony about your design ideas or needs. He’ll help breathe new life into your existing image, or create a fresh look for the concept you have in mind. A professional image will get you noticed and remembered by those you do business with, sometimes when you least expect it. At RJ Bardon you will also have professional art files, available to you, at anytime for any graphic purpose. We’re just an email, or call away! We’re not only available for business graphics. Tony loves to create fun/purposeful art for anything that might require THAT look. Flyers for your band, graduation/party announcements, custom wedding invitations, T-shirt designs…you name it. From mild to “outside of the box”, we can bring it the life.